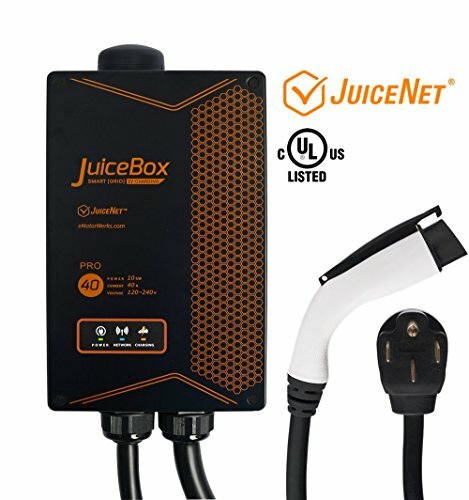 JuiceBox(R) Pro 40 is our UL certified connected EVSE with advanced JuiceNet features. JuiceBox Pro is ready to plug into any NEMA 14-50 outlet or standard 110V outlet (with available adapters) and works with all production EVs on the road today. It offers faster charging and will automatically adjust to your EV and output just as much power as your EV is able to accept. JuiceBox is the smallest EVSE of it's class on the market - portable and robust, it can slide in and out of the included wall mount bracket and be used as a travel charger. It is perfect for customers who might have a more powerful onboard charger in their vehicle or who wish to future-proof their EVSE in anticipation of owning a larger-battery EV in the years ahead. Smartphone Access: Get access to your real-time and historical charging data on our website or via smartphone apps. Easy Control: Schedule and control time of charge, instantaneous power, amperage and more. Set up notifications (e.g. start and end of charge, unit offline, unit back online, full charge by certain time). Circuit load balancing: Configure two or more JuiceBox charging stations to never exceed the limit of your electrical supply circuit. JuiceBox Pro works well with ALL production EVs as it utilizes a standard J1772 charging protocol adopted by all EV manufacturers and has many years experience supporting tens of thousands of installed stations across the world. If you have any questions about this product by JuiceBox, contact us by completing and submitting the form below. If you are looking for a specif part number, please include it with your message.